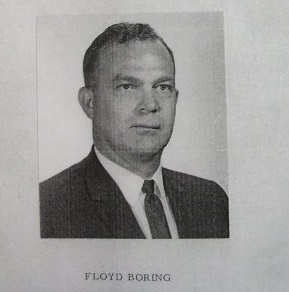 Secret Service Agent Floyd Boring…is very interesting, indeed. 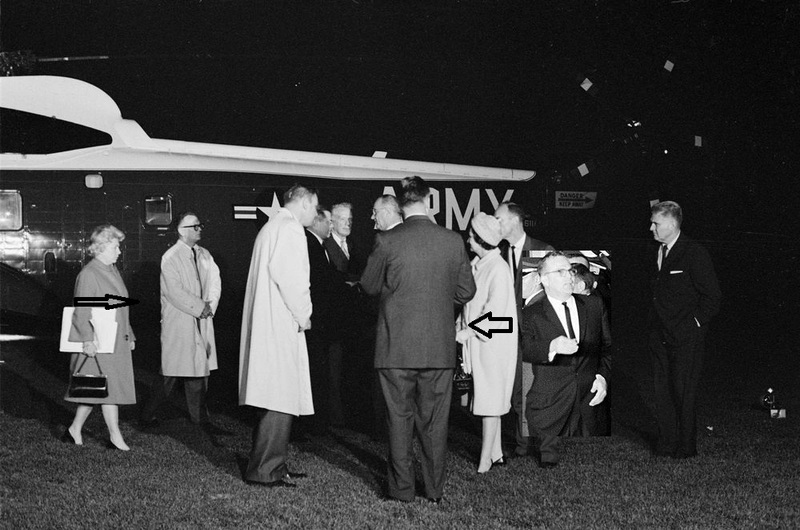 The Secret Service agent I am most suspicious of is Assistant Special Agent in Charge (ASAIC) of the White House Detail Floyd M. Boring, the #2 man on the detail, behind SAIC Gerald Behn and ahead of #3 man Roy Kellerman. 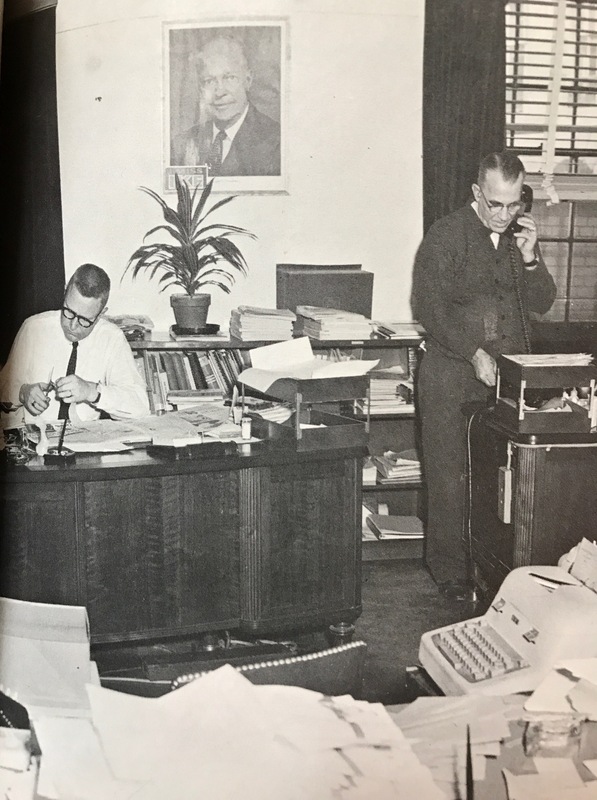 I popularized/discovered the fact that, unbeknownst to many, Floyd Boring just happened to be IN CHARGE OF PLANNING THE TEXAS TRIP! 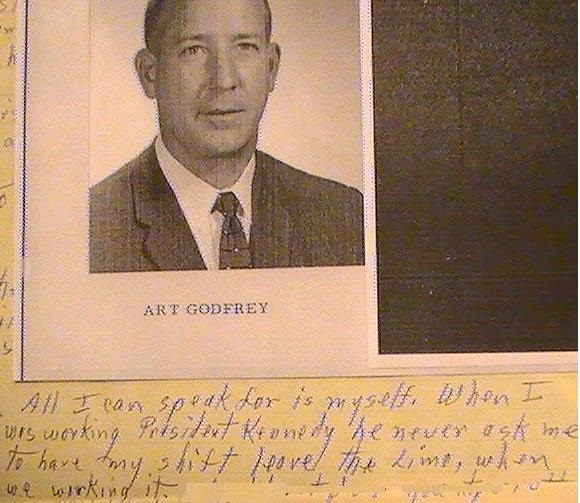 Before you can catch your breath on that one, I also popularized/discovered the fact that, again unbeknownst to many, Floyd Boring also just happened to be IN CHARGE OF ALL THE ADVANCE WORK, ADMINISTRATION, AND PLANNING OF PRESIDENT KENNEDY’S TRIPS! 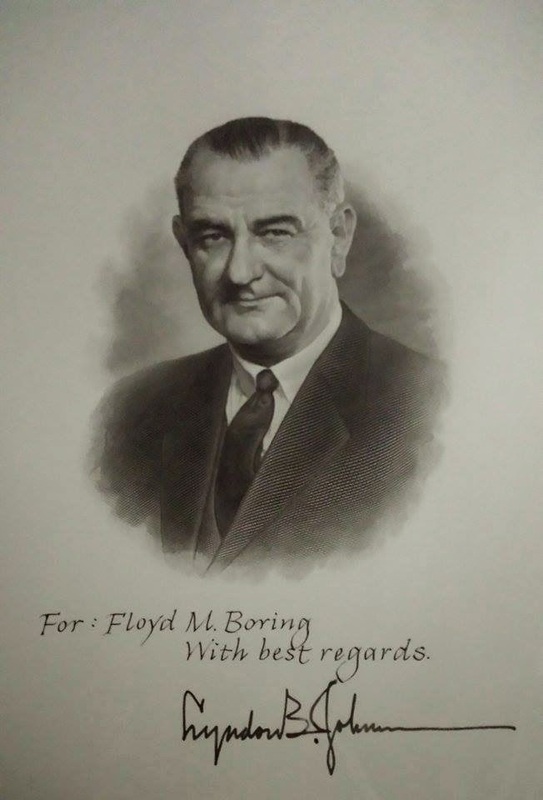 To my knowledge, after years of accessing the JFK Library’s thousands of pages, no other agent was wrongly identified (and, trust me, I checked and rechecked)…only Mr. Boring: twice! 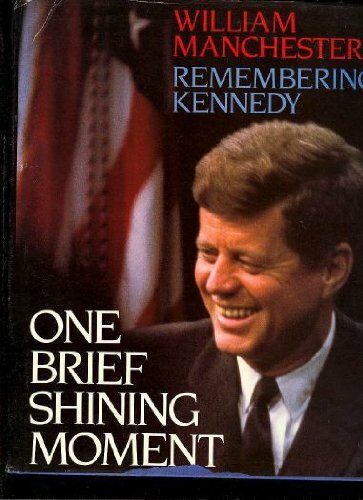 Beyond just the general credibility gap issues, by this specific “recollection” of a supervisory agent OTHER THAN FLOYD M. BORING having been on the Florida trip and having rode in the presidential limousine, these two fine gentlemen have, independent of one another, totally impeached ole Blaine’s book “The Kennedy Detail” even further: how can Blaine write so authoritatively that he heard BORING over the radio relaying JFK’s alleged instruction to remove Zboril and Lawton from the rear of the limousine WHEN HE CAN’T EVEN GET THE NAME OF THE ACTUAL AGENT IN CHARGE OF THE TRIP AND RIDING IN THE PRESIDENTIAL LIMOUSINE CORRECT? 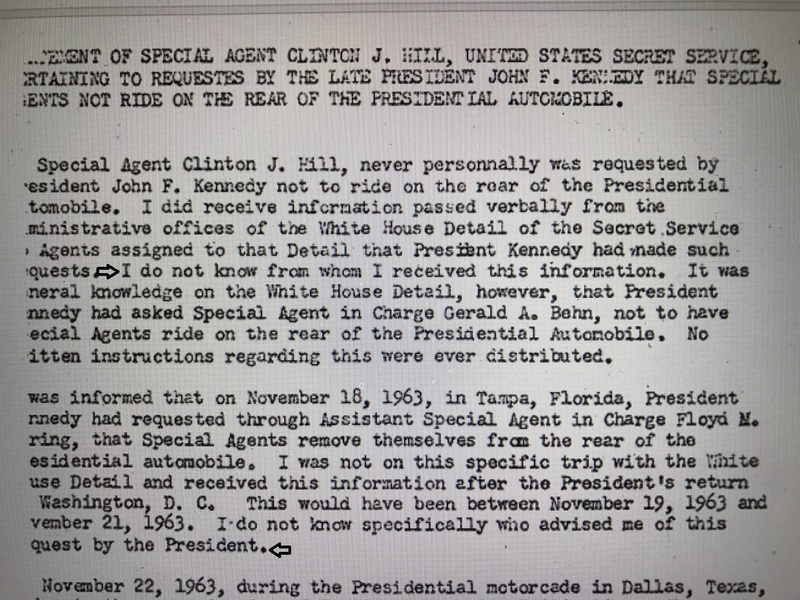 Likewise, how in the world can Zboril vouch for Blaine and his book when he, perhaps in an even worse case of “faulty memory”, ALSO CANNOT GET THE NAME OF THE ACTUAL AGENT IN CHARGE OF THE TRIP AND RIDING IN THE PRESIDENTIAL LIMOUSINE CORRECT…AND BORING WAS THE AGENT WHO ALLEGEDLY RELAYED THIS ORDER/ KIND ANECDOTE/ PRESIDENTIAL WISH (TAKE YOUR PICK) *TO* ZBORIL! 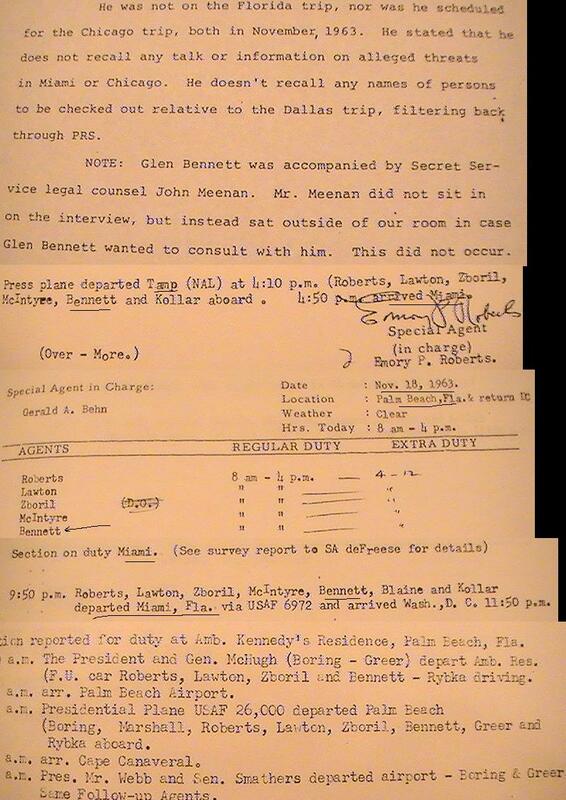 Chuck Zboril recently stated on Amazon.Com that Agent David Grant was NOT an advance agent on JFK’s trip to Florida. 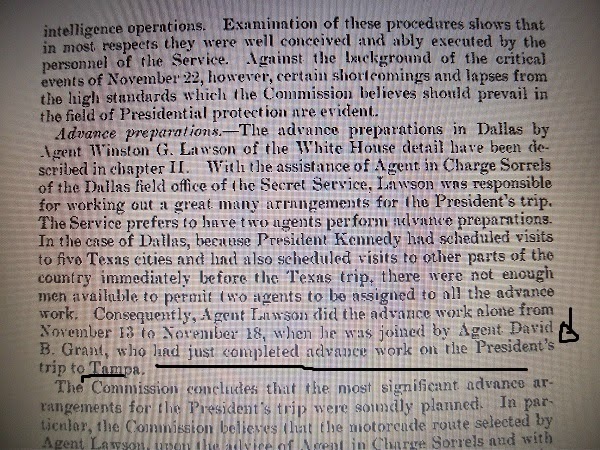 THE WARREN REPORT even states that Agent David Grant was indeed an advance man on JFK’s trip to Tampa (WR page 445). 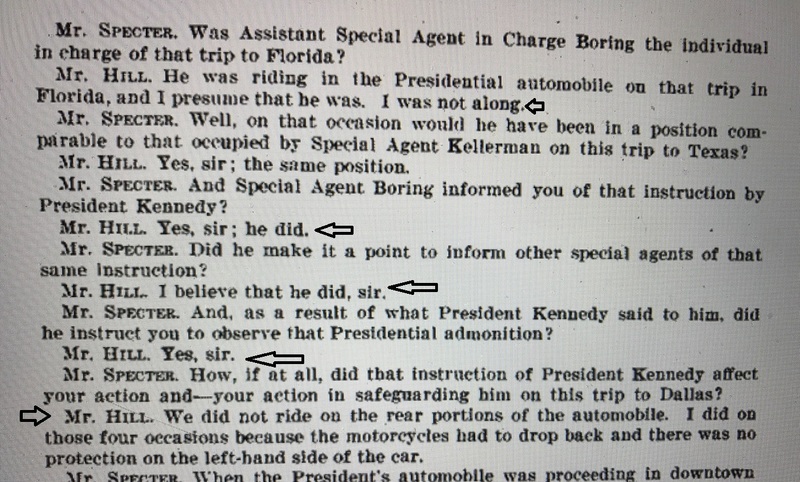 Zboril thought ASAIC Kellerman, not ASAIC Boring, was on the Florida trip (Palamara, page 294) . 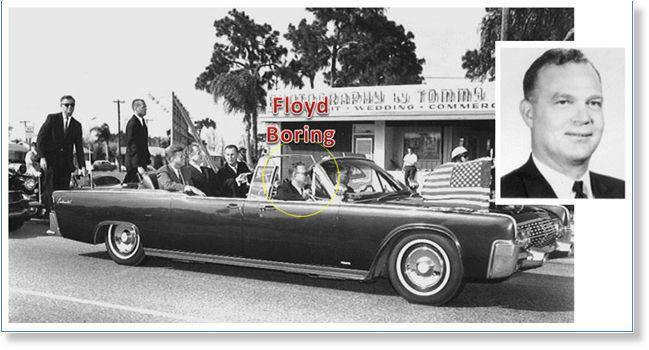 Gerald Blaine thought SAIC Gerald Behn, not ASAIC Floyd Boring, was on the Florida trip (Palamara, page 121)….it was ASAIC Floyd Boring alone. 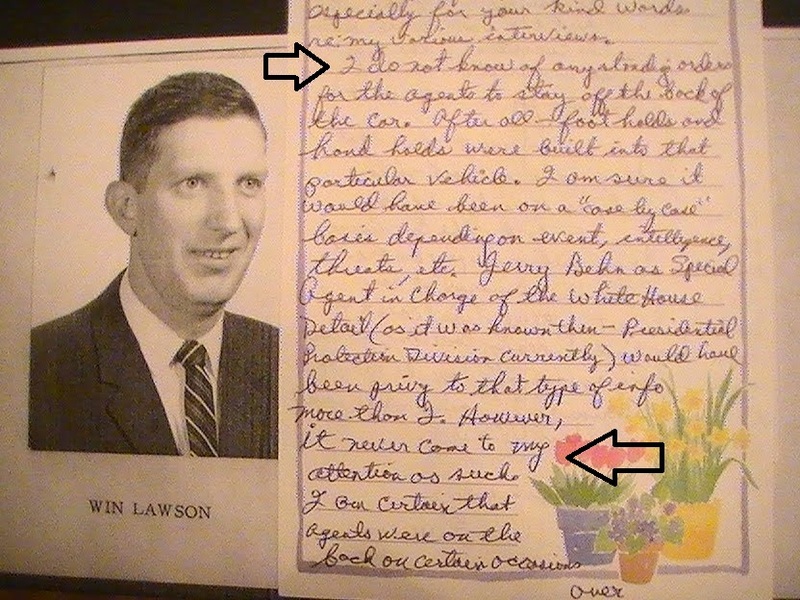 “Skull bone in the rear of the follow-up car”? 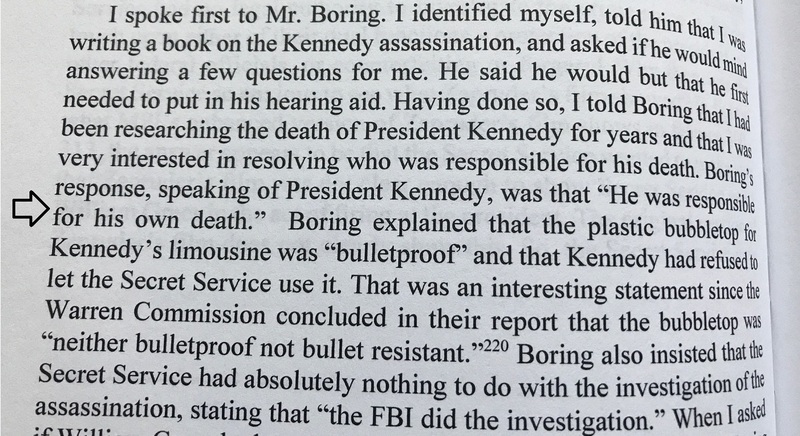 Yes—and Boring is corroborated on this matter by JFK White House Physician Dr. James Young, who even reached to former Warren Commission member Gerald Ford about this! 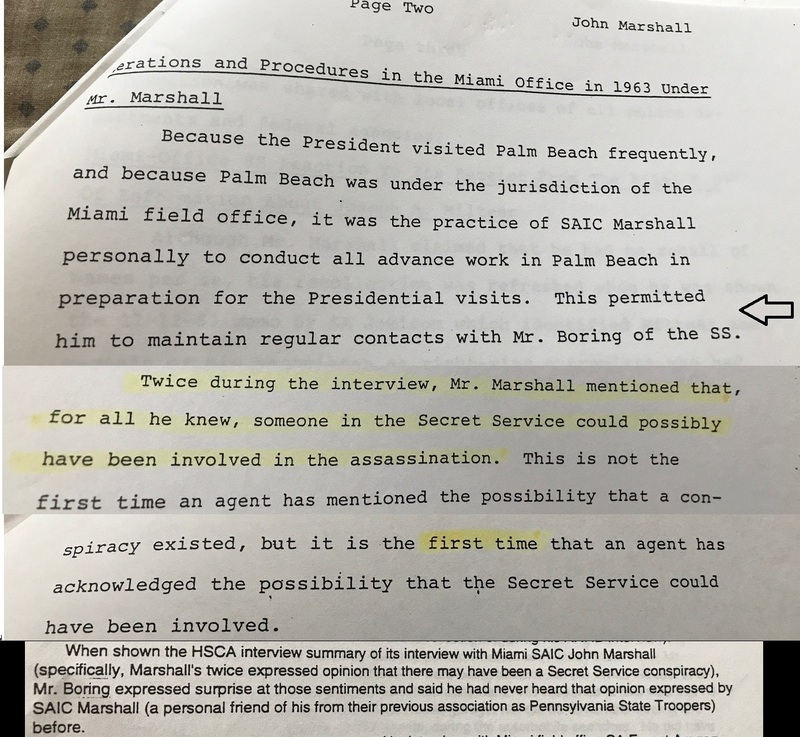 Miami SAIC (and former White House Detail agent) John Marshall was a very interesting character, indeed. 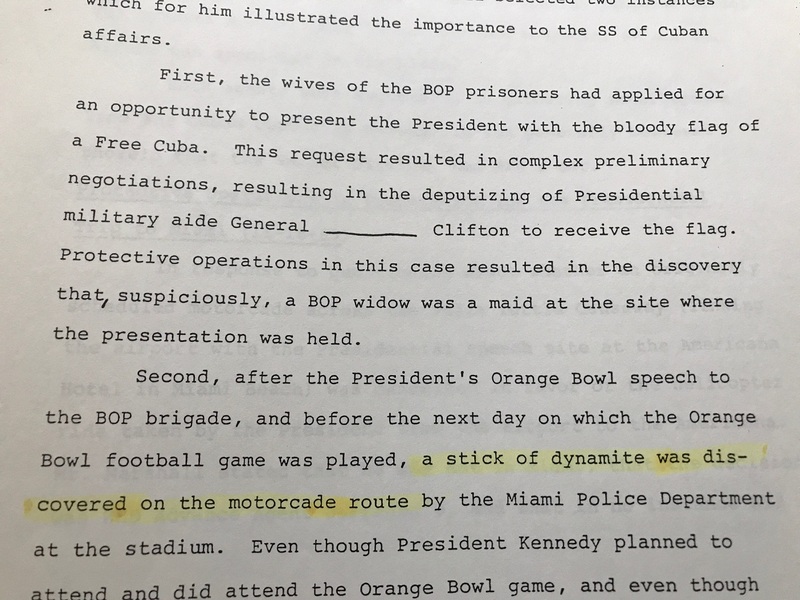 He had worked with Boring before their Secret Service days when the two of them were Pennsylvania State Troopers, worked with Floyd on many occasions while in the Service, took the time to call out Boring in the first place-more than once- in his interview, noted a stick of dynamite found on JFK’s motorcade route to the Orange Bowl in December 1962 the day before he was to attend (and that Ken O’Donnell knew about it, yet the motorcade and event still went on-calling Joseph McBride! 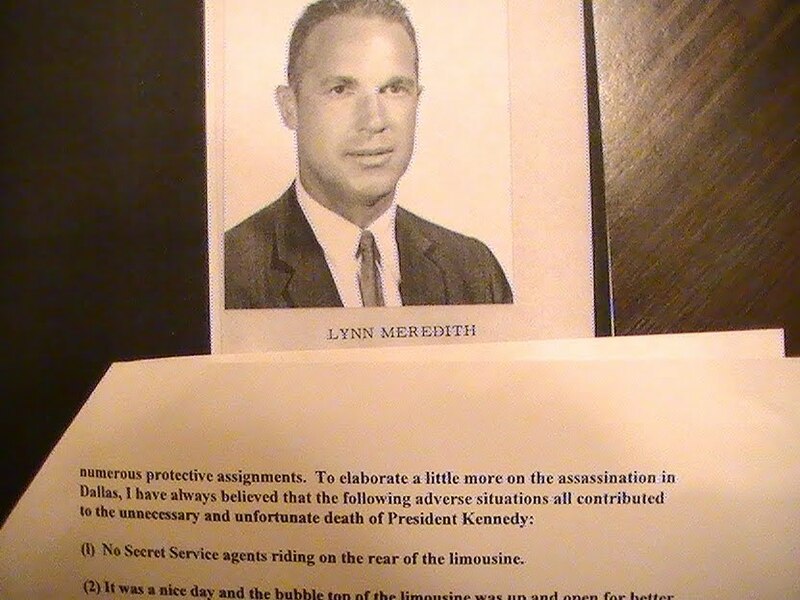 ), and stated, stunningly, that the Secret Service might have been involved in the assassination! Also included is Boring’s reaction to this when confronted by the ARRB. 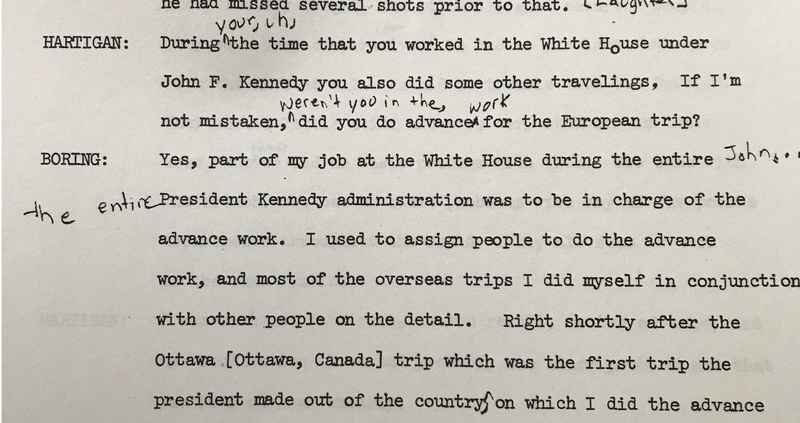 As I wrote in tremendous detail in chapter one of my first book (and expanded even further in my third book), of the five Secret Service reports, four have as their primary source for JFK’s alleged request agent Boring, including one by Boring himself, while the remaining report, written by Mr. Behn, mentions the same 11/18/63 trip with Mr. Boring as the others do. 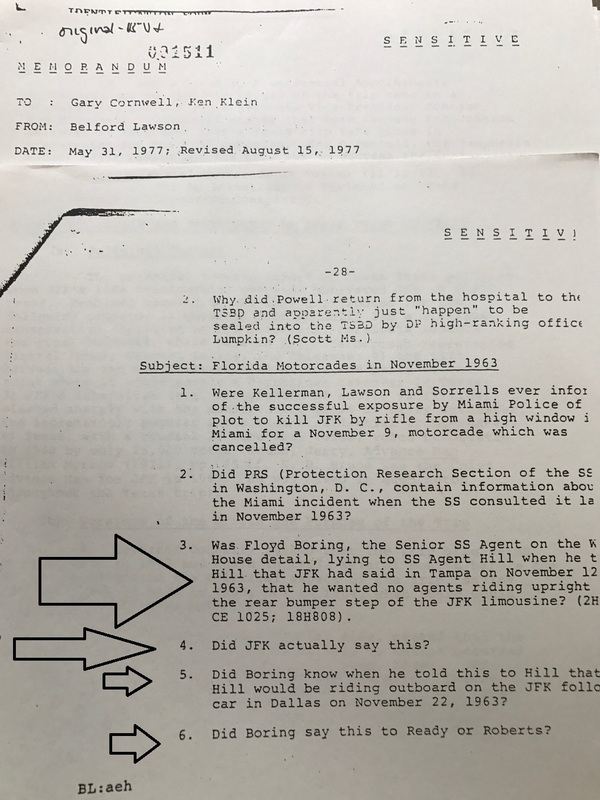 Boring’s report was the first one written, then came one each from Roberts, Ready, Behn, and Hill, respectively (Hill, Ready and Behn weren’t even on the Tampa trip, while Roberts merely conveys the fact that Boring was his source). Both Behn and Boring totally contradicted the contents of their reports at different times, independent of each other, to the author. 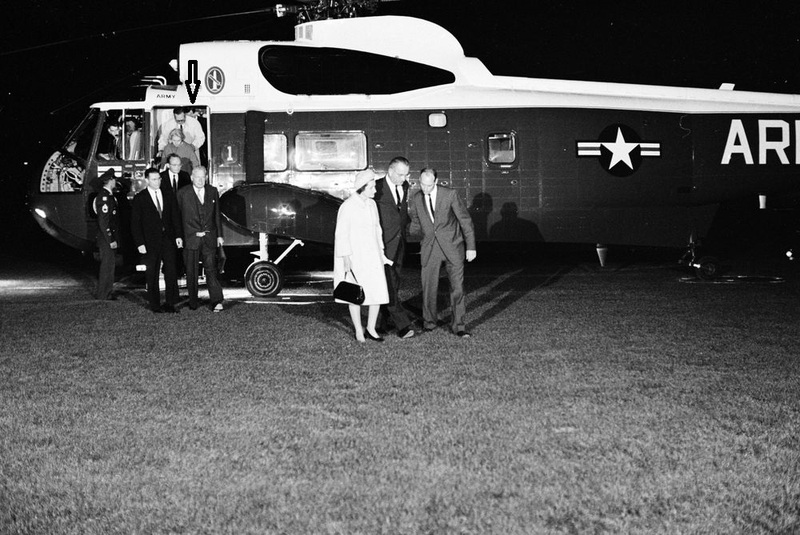 In addition, agents did ride on the rear of the limousine on 7/2/63 and 11/18/63 anyway, despite these alleged Presidential requests, as the film and photo record proves. 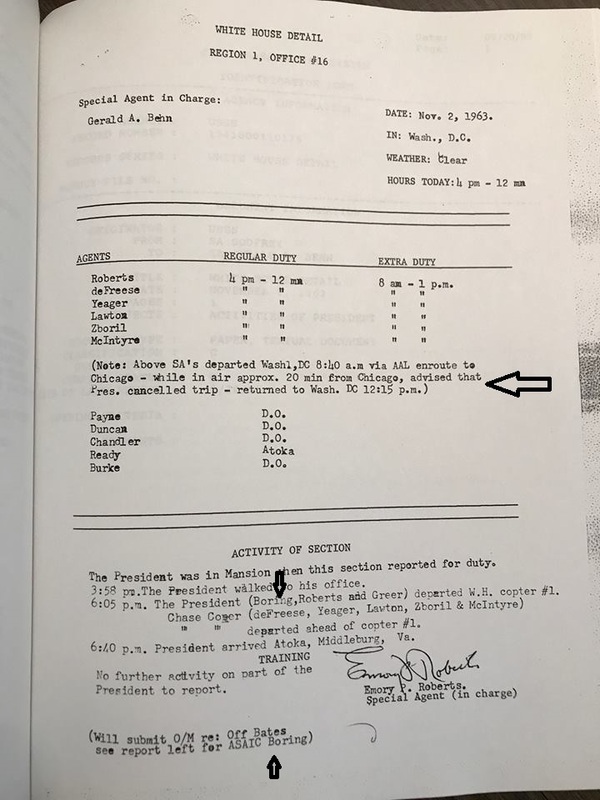 Both the Secret Service Final Survey Report for the 11/18/63 Tampa trip, written by Gerald Blaine and dated 12/4/63, after the fact, as well as the corresponding Secret Service shift reports, make no mention of any presidential orders to have the agents stay off the limousine: “no unusual incidents occurred”, wrote Blaine. 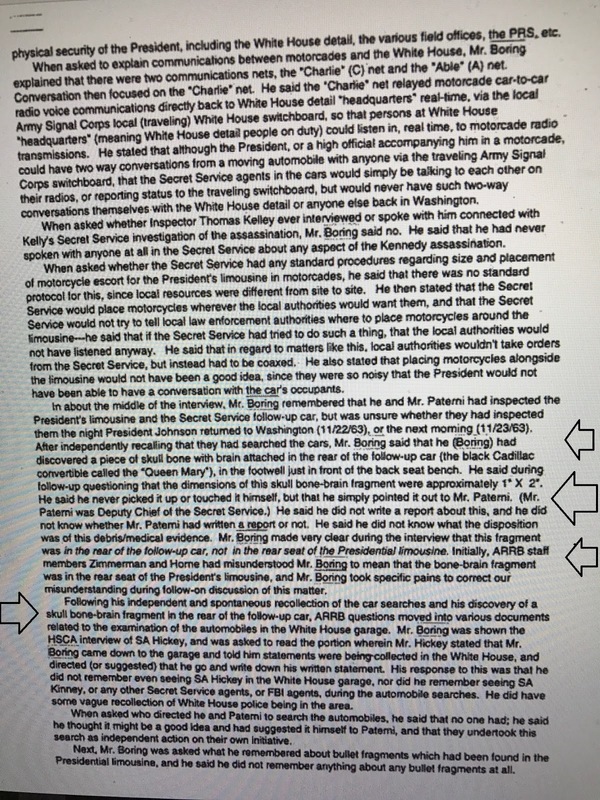 With Boring joining Behn in refuting the substance of their reports, the official Secret Service ‘explanation’ falls like a house of cards. Behn’s, Boring’s, and Hill’s reports are not even on any Secret Service or Treasury Dept. stationery, just blank sheets of paper. 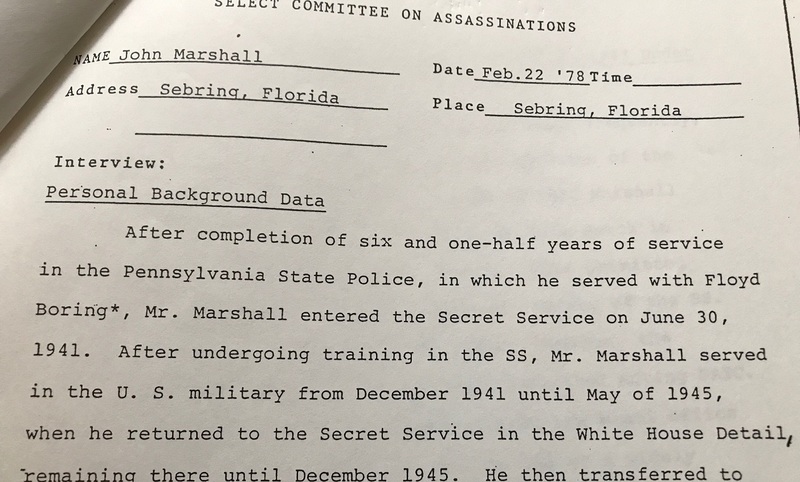 In fact, as noted above, Hill’s report is undated, a bizarre error to make in an official government report written by request of the head of the Secret Service. 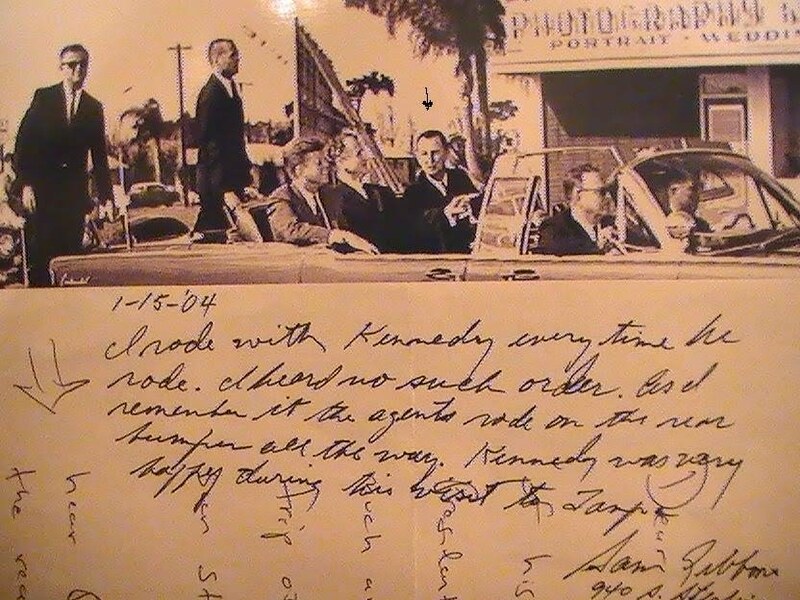 All are supposedly evidence of JFK expressing his desire to keep Secret Service agents off the limousine, particularly in Tampa, Florida on 11/18/63. 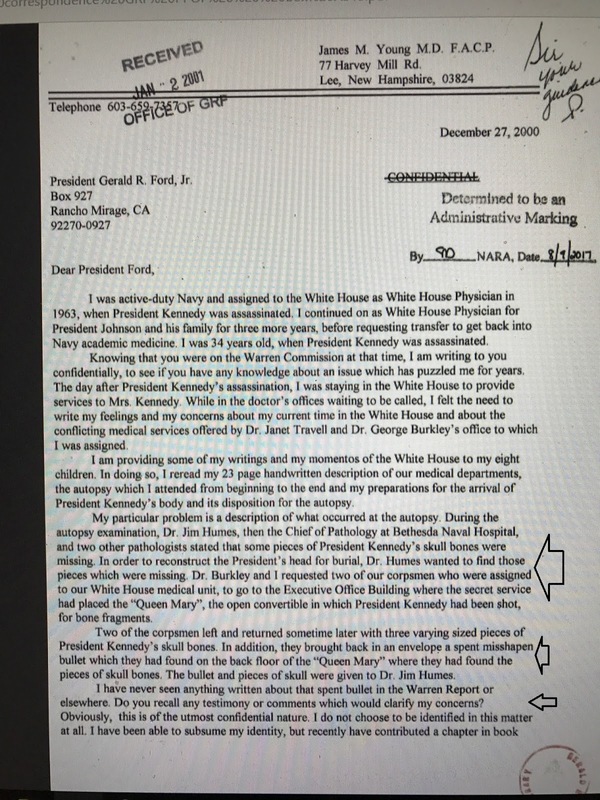 Importantly, no mention is made of any alleged orders via President Kennedy’s staff, or of JFK requesting anything on the critical day, November 22. 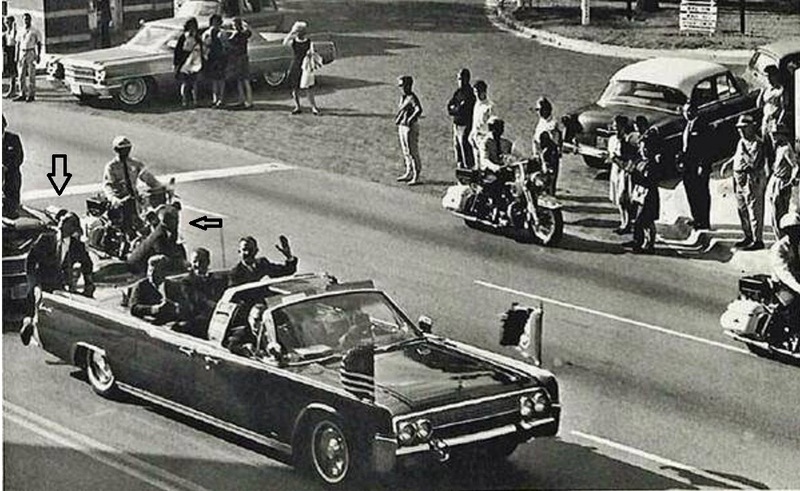 What’s more, Secret Service agents and/or police officers always guarded the rooftops of buildings during motorcades before the assassination (not just as a result of the tragedy), effectively augmenting or, in the absence of agents by the limousine itself, replacing them, depending on manpower issues and so forth. 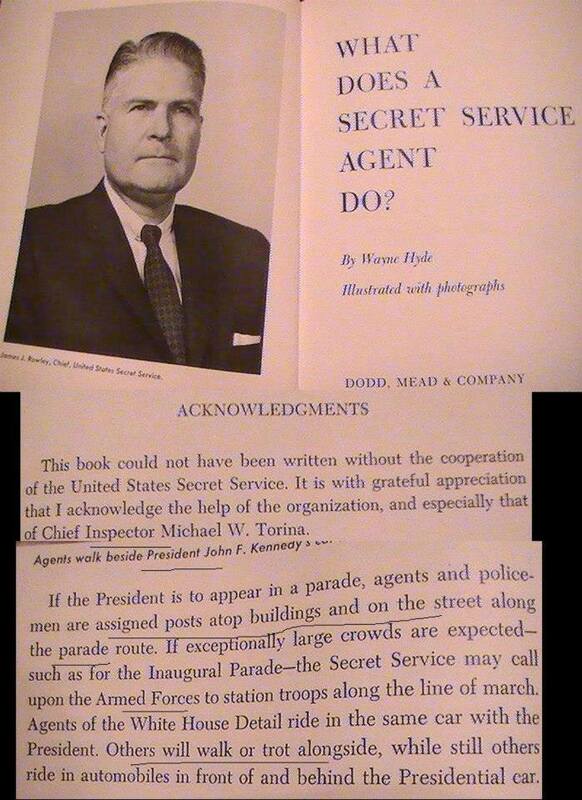 Chief Inspector Michael Torina, whom the author contacted, wrote the Secret Service manual and confirmed this security procedure as a fact. Blaine is credited here, yet his name does not appear in the actual text anywhere; very strange, indeed. 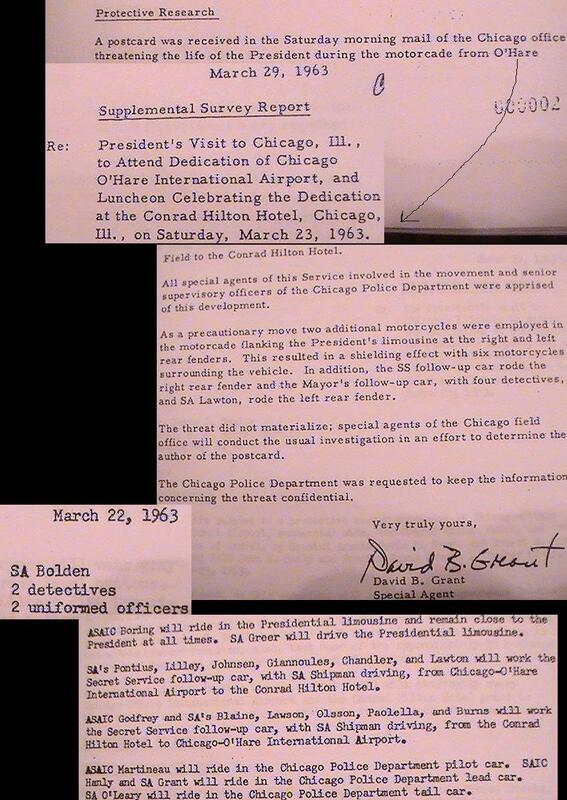 Blaine confirmed to me in 2005 that he did indeed speak to Manchester and, furthermore, out of the many agents Manchester spoke to (not as many as I, but still pretty good), Blaine is singled out AGAIN as one of the FEW agents thanked in Manchester’s OTHER JFK book! 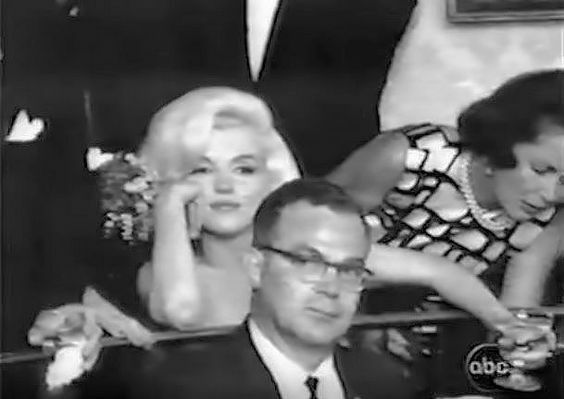 So, what’s the problem (other than–ahem–Blaine appearing to be THE SOURCE FOR THE PHONY “JFK-ORDERED-US-OFF-THE-LIMO” crap)? Well, Blaine is now DENYING that he spoke to Manchester. 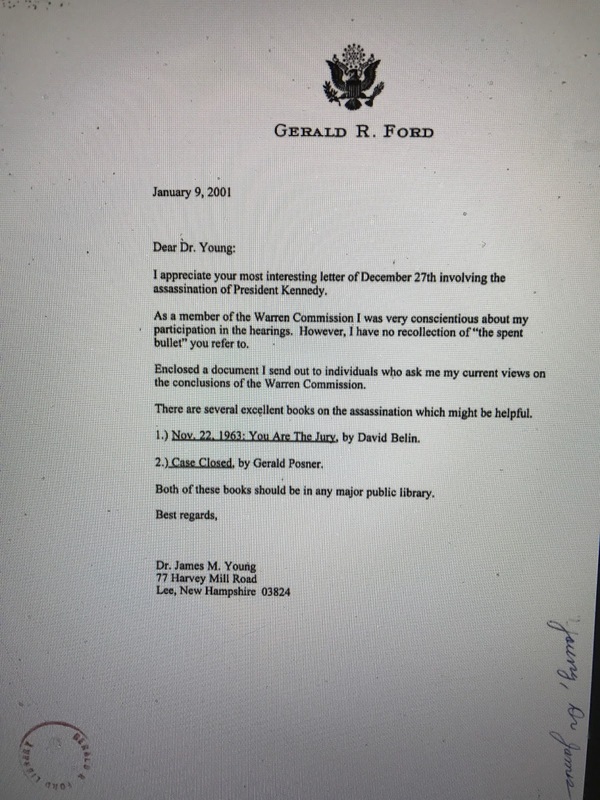 While he confirms that Boring was not interviewed by Manchester (thanks, Jerry), his denial of being interviewed is a lie and he knows it…and I know it, too. 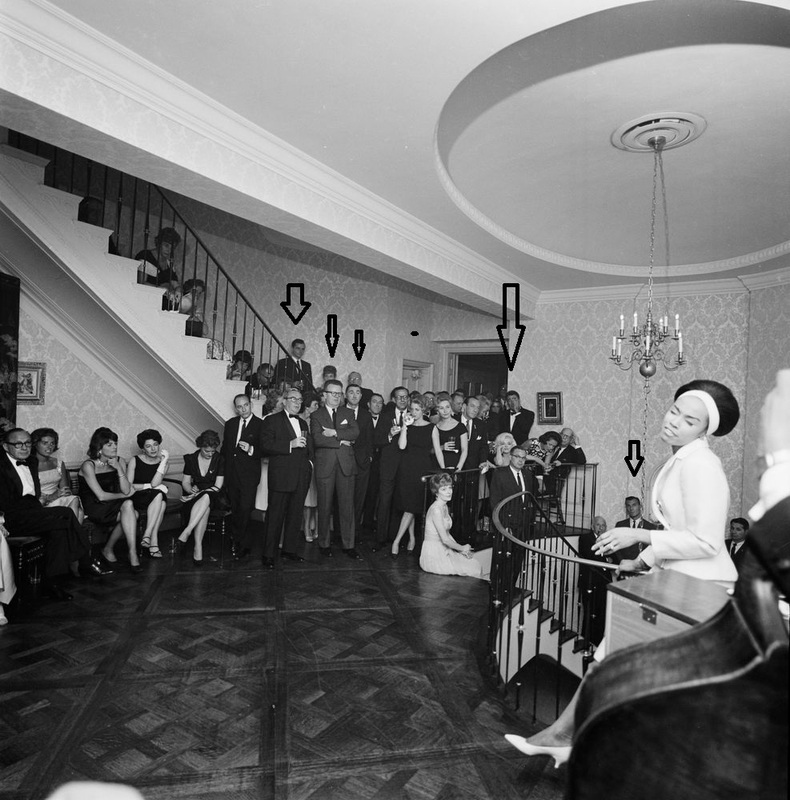 For what it’s worth, I contacted Wesleyan University, which houses the William Manchester collection (I spoke to Manchester in 1993 and he told me that all his records are sealed and won’t be released in my lifetime. 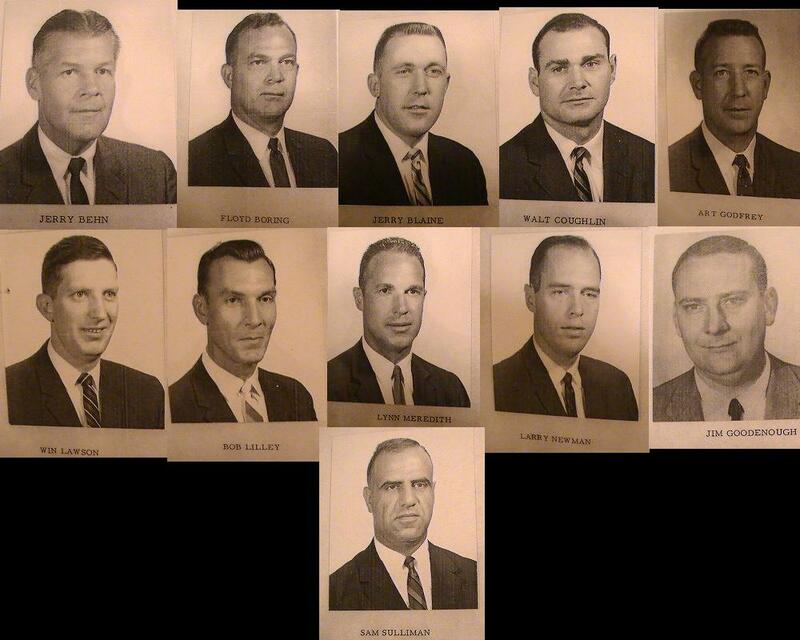 He has since passed away and quite a few, but not all, of his records are now available). 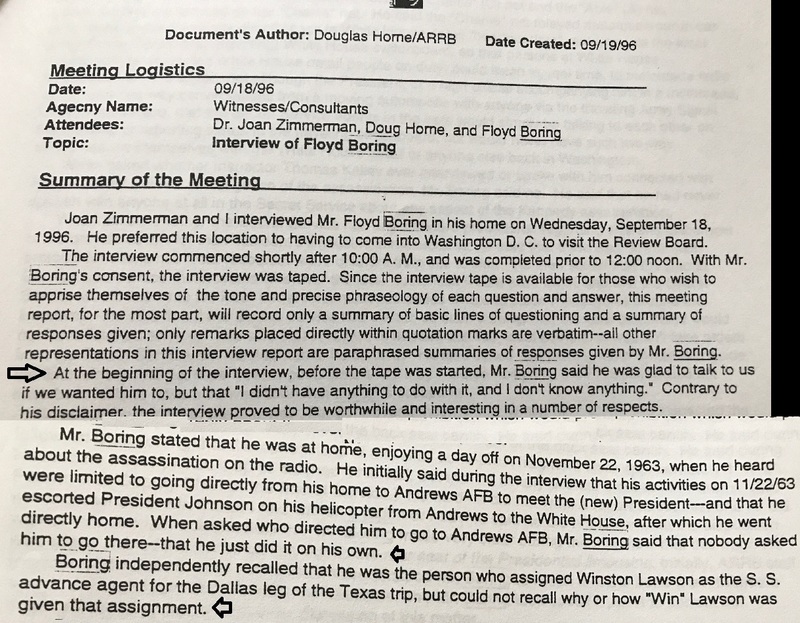 The Blaine transcript is MISSING and they confirmed that there is NO TRANSCRIPT OF A FLOYD BORING INTERVIEW! 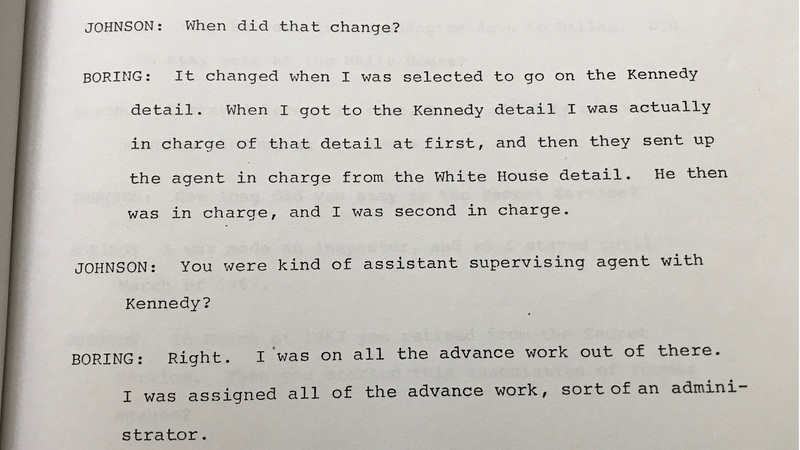 Furthermore, some other agent and White House aide interview transcripts AND JACKIE KENNEDY’S won’t be released until—get this—2067! 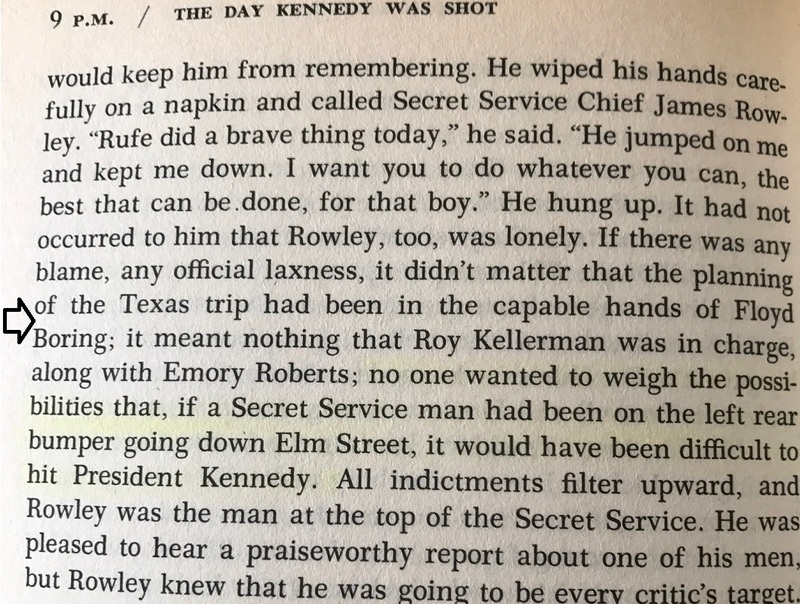 The author finds this admission startling, especially because the one agent who decided to ride on the rear of the limousine in Dallas anyway, on at least 4 different occasions, was none other than Clint Hill himself. 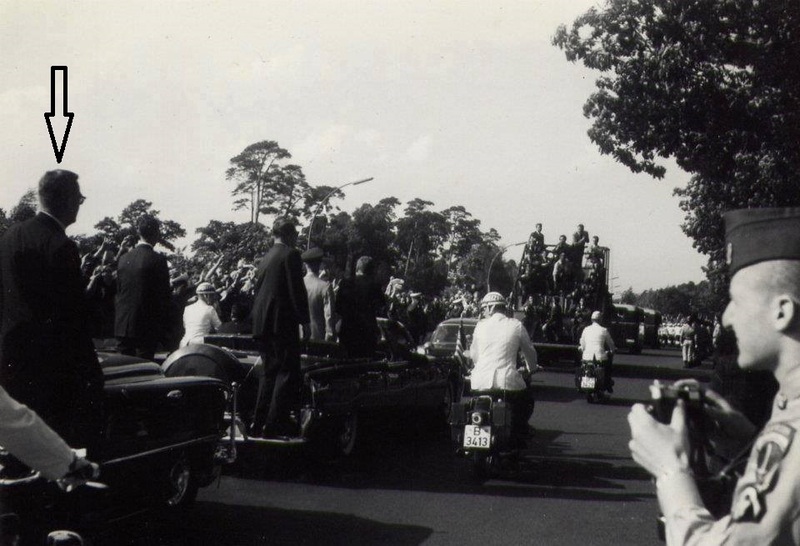 This also does not address what the agents were to do when the crowds were heavier, or even what constituted a “crowd,” as agents did ride on the rear steps of the limousine in Tampa on November 18, 1963 (agents Donald J. Lawton, Glen A. Bennett & Charles T. Zboril, to be exact!) 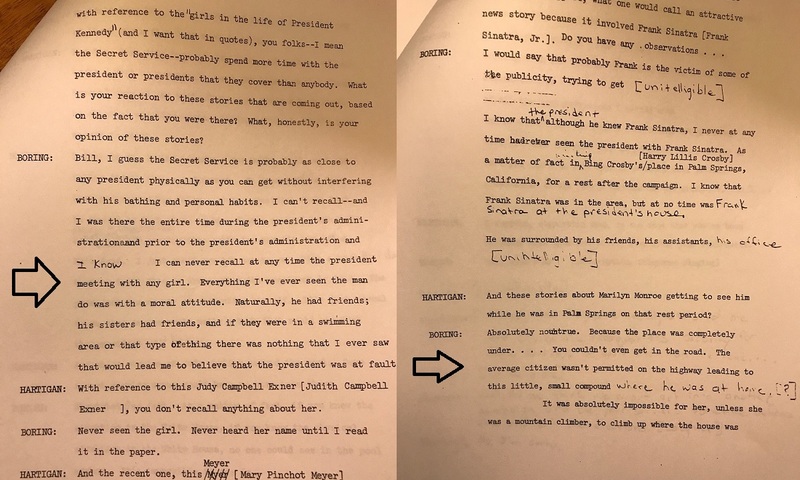 Furthermore, as noted above, both Clint Hill’s written report and his testimony surely convey a more strict approach than one stemming from an alleged kind anecdote. 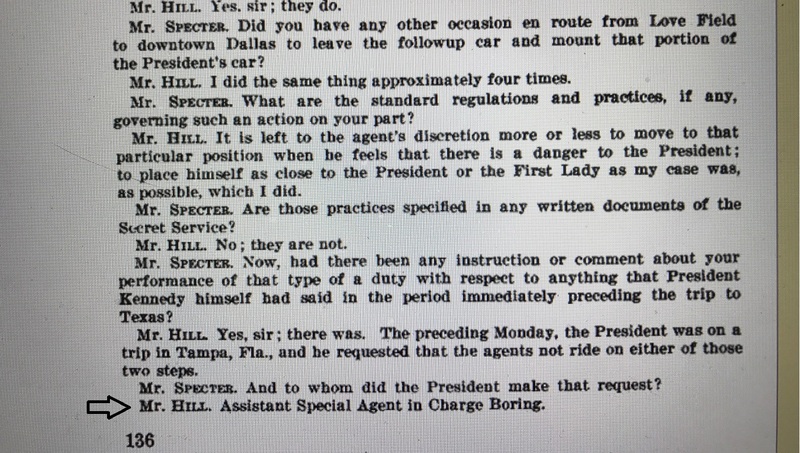 In fact, as mentioned above, Hill twice stated in his report that he did not recall who the agent was who told him, and the other agents, not to ride on the rear of the limousine, yet named him under oath to Counsel Specter: Floyd Boring. 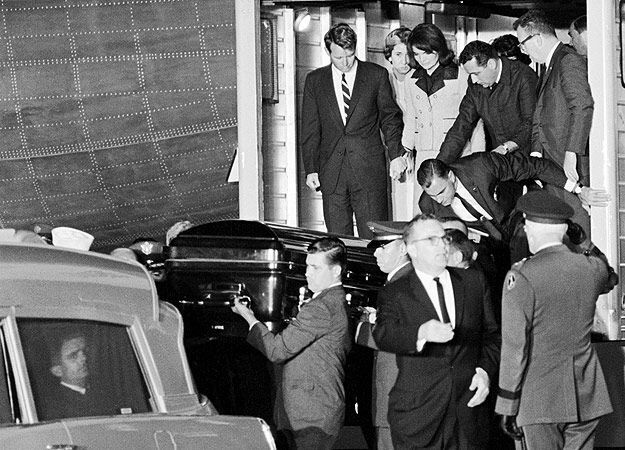 “He [JFK] was responsible for his own death.”–?! 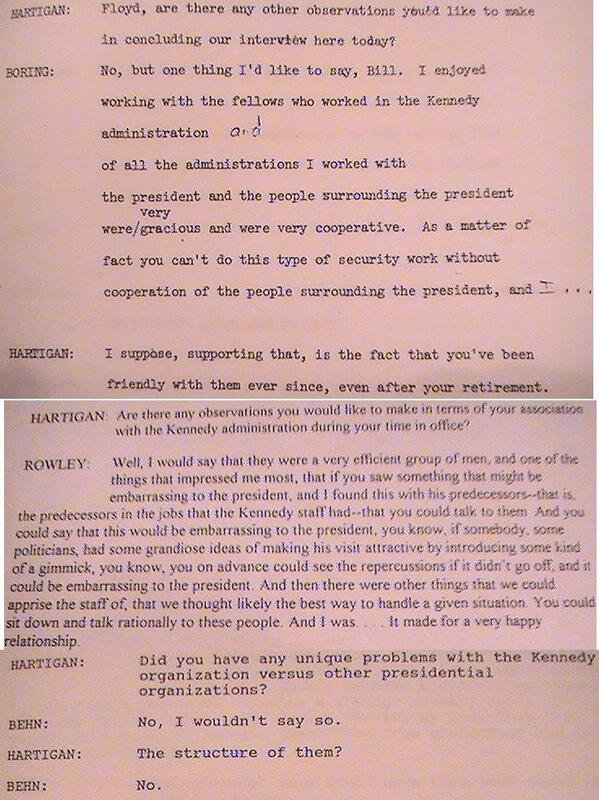 So, how DID ole Secret Service headquarters think about President Kennedy behind closed doors, so to speak? 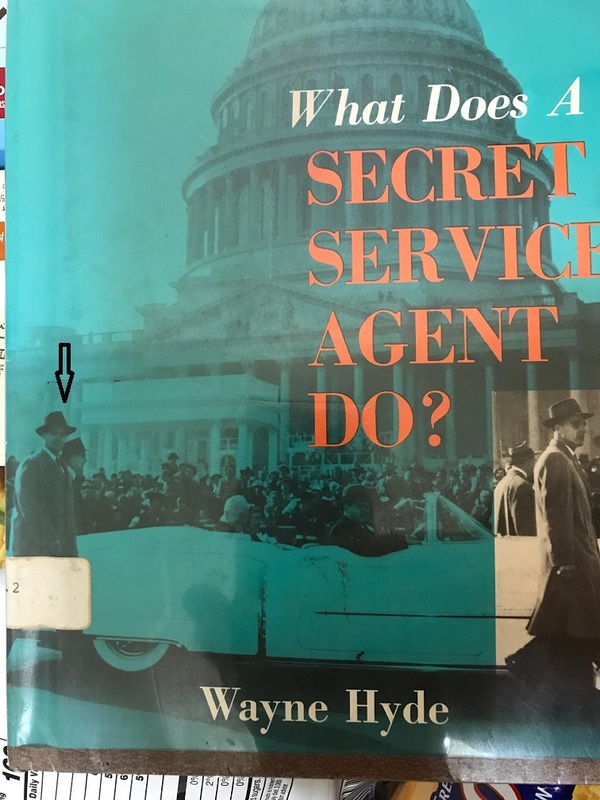 Part of the answer may lie in an obscure, out-of-print book from 1962 by Wayne Hyde (with, ironically, Boring on the cover) titled What Does A Secret Service Agent Do? 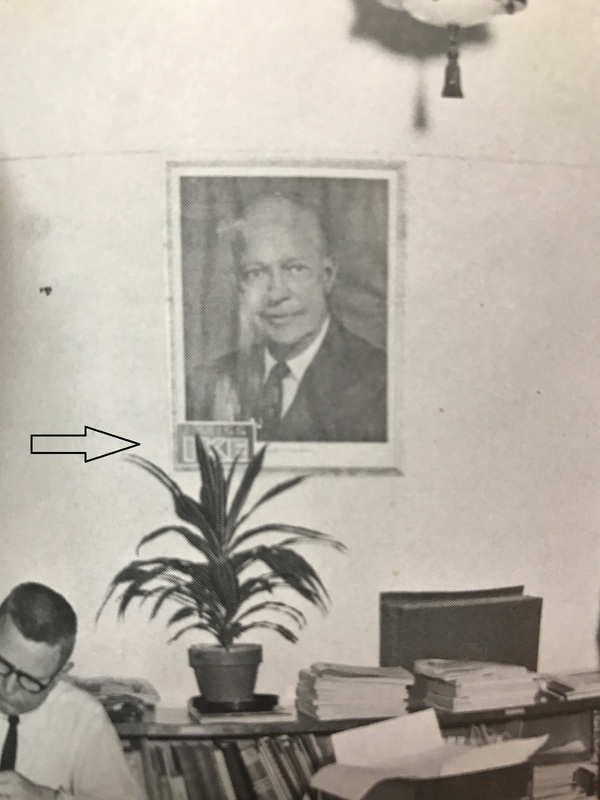 On page 14, Secret Service headquarters is depicted with a photo of President Eisenhower, not the then-current office holder, JFK, on the wall. 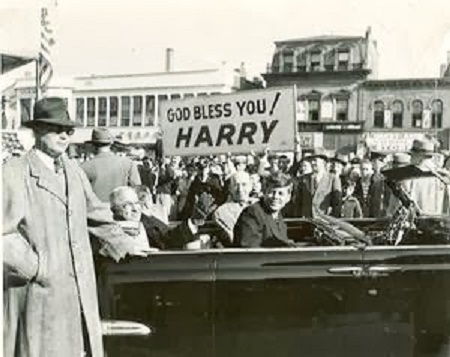 An older photo, perhaps? No: for there is a disturbing sticker at the bottom left corner! “I Miss Ike”, huh? Imagine if today’s Secret Service Headquarters had an “I Miss Obama” sticker: heads would roll…but, alas, no one on Earth noticed this but I, decades later. 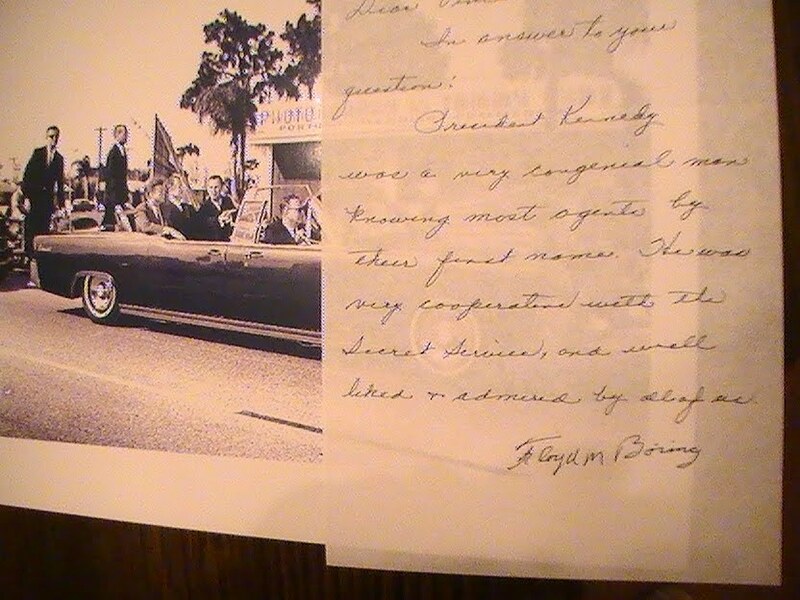 Oh, yes: Yeager was assistant advance agent in Tampa with GERALD BLAINE, the same trip FLOYD BORING was on! I told you Boring was interesting! 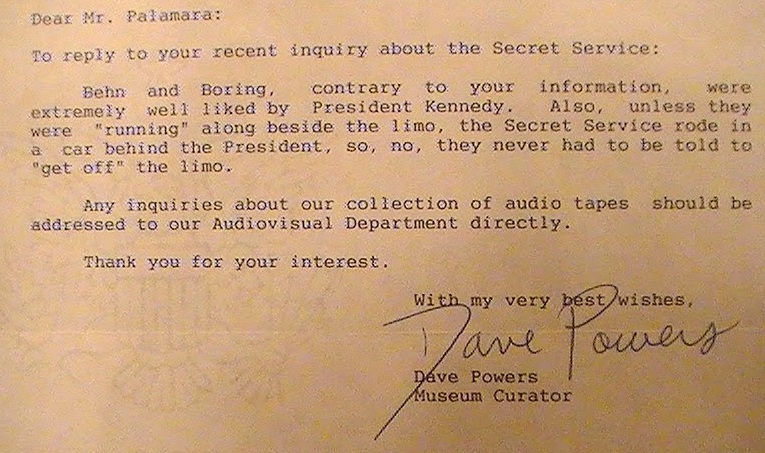 1 Response to Secret Service Agent Floyd Boring…is very interesting, indeed. 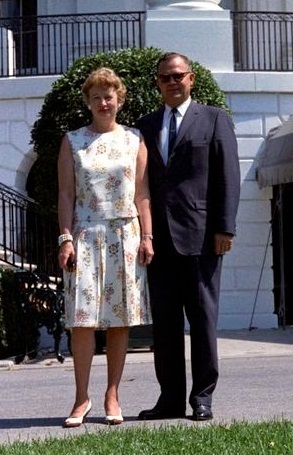 Jack Puterbaugh and Elizabeth “Betty” Forsling Harris were also planners of the Dallas visit. 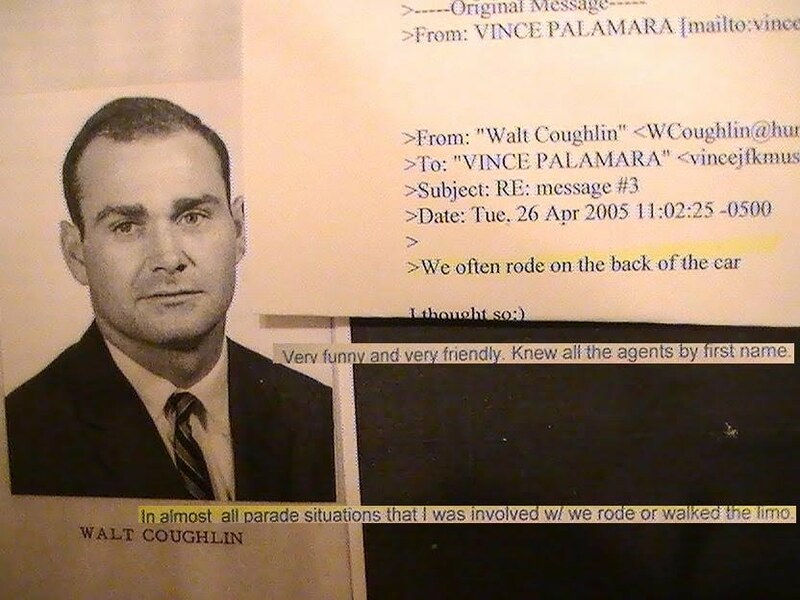 Puterbaugh said “Kenny O’Donnell’s office” authorized the turn onto Huston / Elm.